There are still a few spots left to join Pat and Kim Dorsey in Patagonia (Argentina) for a trip of a lifetime! 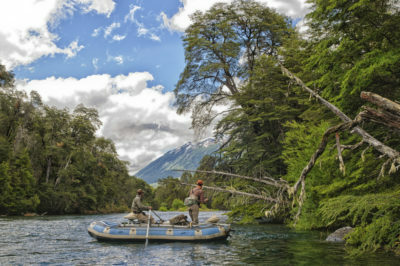 Fly fishing in the heart of Patagonia is a unique experience. When you visit Rio Manso Lodge, you will have the opportunity to fish a variety of fisheries including small streams, large rivers, intimate spring creeks, and deep lakes where monster brown, hefty rainbow and trophy brook trout swim. Early-to-middle December, anglers will experience dragonflies hatching on the lakes and rivers bringing up some the biggest fish to feed on the surface. Dragon fly nymphs and Wooly Buggers are also effective during this time frame.